“The shortest distance between two points is a straight line in the complete and opposite direction.” – Ty Webb. Sometimes in life in order to get where we want, we need to put in some time at different stops along the way. 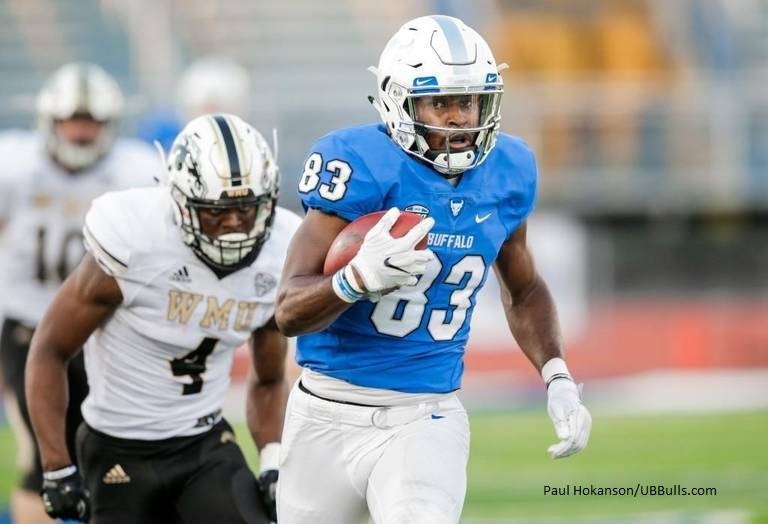 Buffalo wide receiver Anthony Johnson (#83) took a circuitous route to the FBS level but certainly made a big splash when he arrived. A standout two sport athlete in high school, Johnson started out his collegiate career by heading west to Butler Community College in Kansas, a school which has had several current NFL players pass through their program including Demarcus Lawrence, Bruce Irvin and Chris Carson. He had a solid year, recording 21 receptions for 559 yards and 5 touchdowns. From there he traveled north to Iowa Western Community College where he had decent numbers, including 19 receptions for 434 and 2 touchdowns. After being lightly recruited his travels took him east to play for head coach Lance Leipold in the Bulls spread offense and he announced his presence with authority from game one. In that game against Minnesota he put up an 11 catch, 140 yards, 1 touchdown line. That was the first of 6 games where he would gain at least 140 yards. He cooled off a bit for games two through five, totaling 15 receptions in those contests. Over the final 7 contests he found his groove, though, with 50 receptions for 920 yards and 9 touchdowns. He finished the year second in the FBS in yards receiving per game (113) trailing only James Washington of Oklahoma State and he was 3rd with 14 touchdowns. At 6’2” and 207 pounds he has the size you look for in a number one receiver. He gets moved around in the offense lining up on the left or right, outside or in the slot and they’ve even lined him up alongside of the quarterback in the backfield. He plays with good quickness and uses his hands well to swipe away the hands of the defender in tight coverage. He can eat up space quickly and get position against off coverage. He runs more routes to the outside than inside but runs the entire route tree, can adjust well around his frame, and shows good sideline awareness to keep his feet in bounds. He’s a natural pass catcher with soft hands and is able to track the deep ball well, making several over the shoulder catches. His effectiveness on 50/50 balls improved over the course of the season. Early in the season there were some I thought he should’ve caught but I think once he got used to the competition level he began to come down with a much higher percentage of plays. He also showed improvement after the catch with his quickness and change of direction abilities to make the first guy miss and gain extra yards. Another aspect that caught my eye which could be an offensive philosophy or just the connection between he and his quarterbacks is that after he made a big play they would go right back to him on the very next play that ended up being a touchdown a couple times. They used him on end arounds and jet sweeps a couple times but he had limited success as a runner. However, he was more than willing to help out his teammates as a capable run blocker and hustling downfield to block for others. 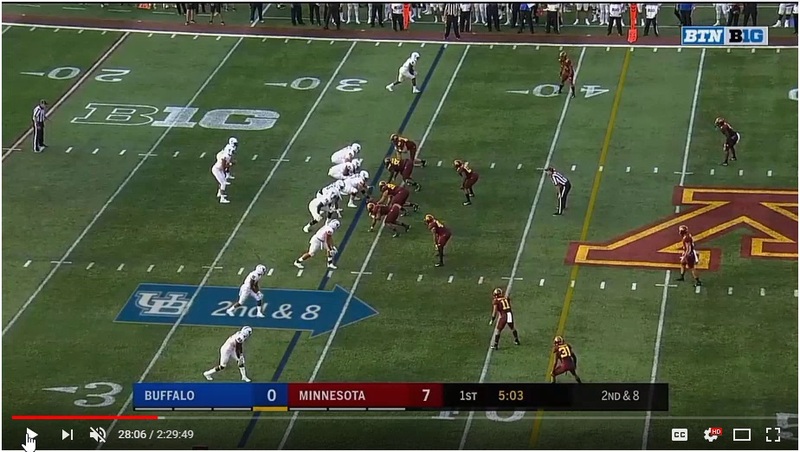 At Minnesota, Johnson is lined up wide right and it’s a go route against off coverage in a four verticals concept. He shows good acceleration to eat up space and gets to the outside of the defender. The throw is over his outside shoulder which he tracks well and brings in for big gain. He caught a touchdown on the very next play. Against Florida Atlantic he’s lined up wide left versus tight man coverage. He shows a hesitation move with quickness to get outside. Good effort to not let his hands be controlled by the defender in the route and he gets them up late to make the sideline touchdown reception. Versus Western Michigan, Buffalo ran this play a couple times to both sides of the field. Motions across the formation for a screen in the flat. Hands catch away from the body, Johnson gets his head around quick to locate the blocks. Reads them well and shows great lateral quickness and then a good burst to get up field quickly. Also against Western Michigan, Johnson is lined up wide left. Similar hesitation to get to the outside, he gets his head around to take in a back shoulder throw and is able to control the ball despite the defensive back being all over him. At Ball State he’s lined up in the backfield to the left of the quarterback. Pre snap motion to the right for a swing screen. Shows good change of direction and agility to make the first to guys miss and then weaves his way through traffic for a 15 yard gain. At Ball State once again, lined up in the left slot he runs a post route versus zone coverage. He goes up to make the catch behind the linebacker and under the safety while the safety swipes at the ball. Johnson is explosiveness out of his breaks when running routes. He has shown the quickness and speed in other aspects of his game but there’s always room for improvement and being able to separate from defenders will be paramount at the next level. More routes to the middle of the field. Digs, slants, curls and post routes in particular. He does a lot of his damage on the outside of the field, and he does it well, but it would increase his effectiveness overall if he were equally effective inside. Let it fly. He flashed above average athleticism from time to time. It feels like there may be more there than he’s shown so far which is exciting to consider. After a dynamic first year in Buffalo there’s a lot to like about Johnson. He’s got all the makings of a big time receiver and he should be completely comfortable now at this level of competition to maximize his abilities, polish his routes and be even more dominating in the MAC. He’ll probably encounter more double coverage this season but I think his receptions number could go up significantly. Some have Buffalo winning their conference and getting to the league championship game and Johnson along with quarterback Tyree Jackson (#3) and linebacker Khalil Hodge (#4) will have a lot to say about that. His journey has had a few stops along the way. His next will be in the NFL. So are you ready for some MACtion? Follow Tom on Twitter @THMead3. Check out his other work here, such as his look at UC Davis WR Keelan Doss, his preview of Missouri DT Terry Beckner, Jr or his look at how paying a high salary veteran QB may hurt your chances of winning.